Episode 043 ANECDOTES - Kate Willett: "Just let me be an idiot" – Let's Talk About Sets! Episode 043 ANECDOTES - Kate Willett: "Just let me be an idiot"
Newly-minted Netflix “specialist” Kate Willett gets down and dirty with us on stand-up ANECDOTES. Anecdotes are distinct from storytelling. They often lack a complete storytelling framework–a beginning, a middle, and an end. They’re usually “pointless.” There are no emotional expectations that then are either met or shattered. No one’s life is changed by an anecdotal incident. Yet these flimsy, insubstantial retellings of inconsequential events are the backbone of a lot of the best stand-up comedy. 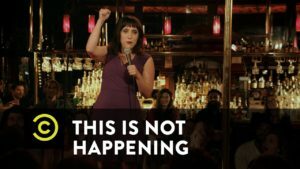 Whereas a most people may simply relay an entertaining or provocative anecdote, a stand-up comedian mines that anecdote for unexpected meaning and connections. And the comic does so fallaciously; no logician would accept that seeing one crazy lady in a grocery store is proof that all grocery stores make ladies crazy. But if the comedian can make that claim seem sound for a moment, we laugh. Indeed, anecdotes are often not just fallacious in stand-up. They’re routinely apocryphal as well; it probably didn’t happen the way it’s being told. There’s something about an illogical flight of fancy that’s just hilarious. We explore all this via bits by Maria Bamford, Brian Regan, and Kate herself. Kate Willett is a comedian, actress, and writer whose raunchy feminist storytelling is both smart and relatable. 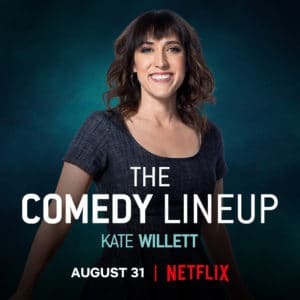 Her 15 minute special premiered on Netflix’s “Comedy Lineup” in August 2018. She was recently a correspondent for the JIM JEFFERIES SHOW at Politicon 2017. She’s been featured on Viceland’s FLOPHOUSE and her appearance on Comedy Central’s THIS IS NOT HAPPENING was on Splitsider’s list of “2016’s Best Late Night Standup Sets.” In the past, she toured with Margaret Cho nationally and internationally and has featured with comedians like Kyle Kinane, Jen Kirkman, Ali Wong, Dana Gould, and Greg Behrendt. Her comedy album “Glass Gutter” was released in 2017. Thank you, Kate! Make mistakes. We support you! Special thanks to Maria Bamford’s vocal stylings and Brian Regan’s goofy lovability. And, Salt N’ Peppa, you’re the spice of my life.